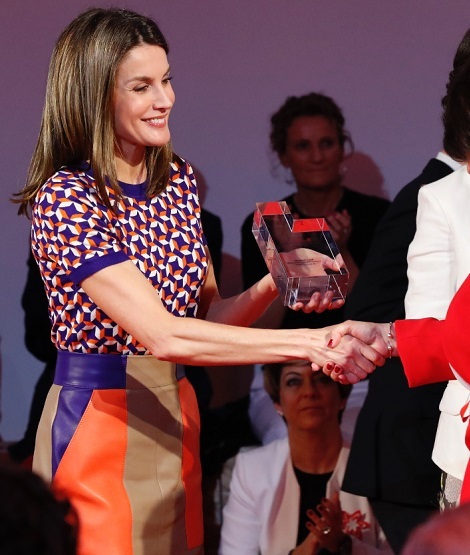 Today Queen Letizia presented the awards to the winners of the X Call for Social Projects of Banco Santander “Euros de tu nómina” at the Palace of Las Alhajas in Madrid. The objective of the awards is to encourage the collaboration of non-profit entities in the implementation of projects that contribute to improve the quality of life of vulnerable groups. Letizia presented the awards to 10 winners who were chosen out of 250 nominees. 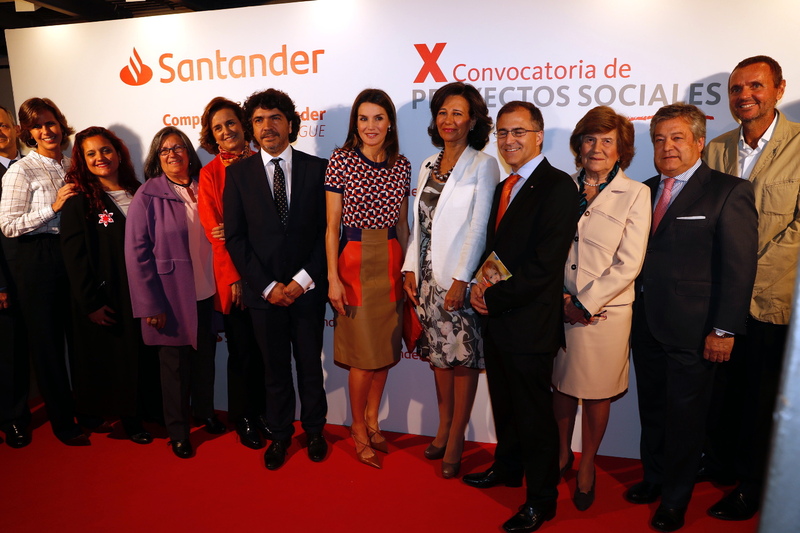 In a decade long initiative a total of 2.5 million euros have been distributed, 70 initiatives have been supported and more than 40,000 people have been helped through the social Projects Banco Santander. Of the 250 projects presented on this occasion, a committee of experts selected 25 finalists and among them, the professionals of the entity have voted to choose two winning projects from each of the five categories: international cooperation, disability, health, social exclusion and Child education. Each of the ten winning entities receives 47,294 euros from the “Euros de tu Nómina” fund. This fund is financed through donations from Banco Santander employees participating in the internal “Euros of your payroll” program, in which, for each euro contributed by the employees, the entity places another. In this call a total of 472,939 euros have been raised. As a novelty, this year a special prize has been added to the Spanish Red Cross for more than 150 years, contributing to the improvement of the welfare of the most vulnerable groups in particular and the entire population in general. Santander has been working closely with the Red Cross for years through various initiatives, from the sale of gold raffle tickets to our offices, participation in the day of the flag, or volunteering to collect food and solidarity toys. , or help in natural catastrophes. In addition, Her Majesty the Queen gave a special recognition to the work of the Santander Spain volunteers. Thanks to them, a network of more than 5,000 volunteers has been created in Spain, which has allowed, among other initiatives, the development of the Santander Help Program, whose goal in 2017 has been to improve the quality of life of more than 20,000 people in precarious situations. For today’s event Letizia chose a bright and colourful look. 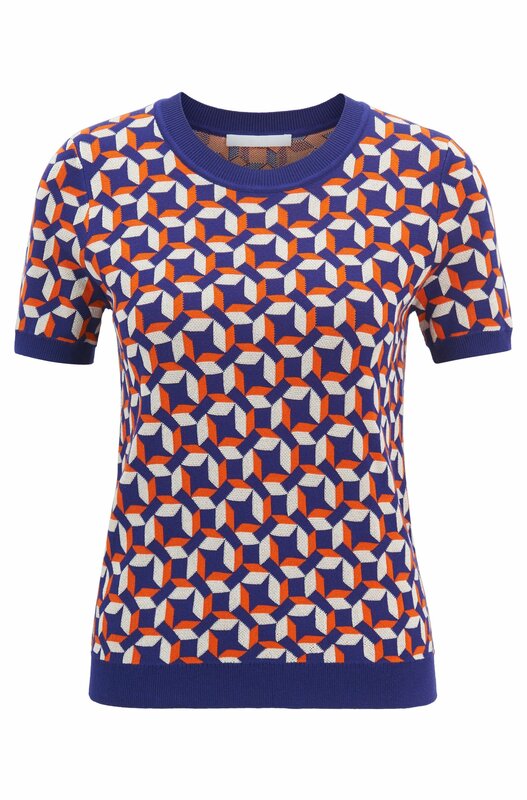 She was wearing Hugo Boss Short-sleeved ‘Felisabeth‘ sweater with multicoloured pattern. 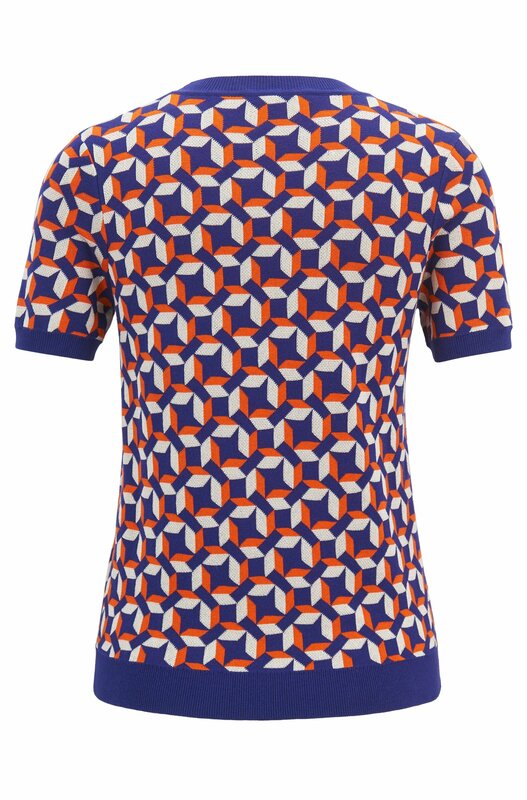 A high-impact sweater knitted in a lustrous yarn blend with touches of silk and cotton by BOSS Womenswear is styled with a crew neckline and short sleeves, This modern piece features an all-over graphic pattern framed by contrast ribbing at the hem, collar and cuffs. The sweater is available at Hugo Boss for €179. Letizia paired the sweater with a camel colour leather skirt that features a bright orange side pockets and navy blue highlighted waist. 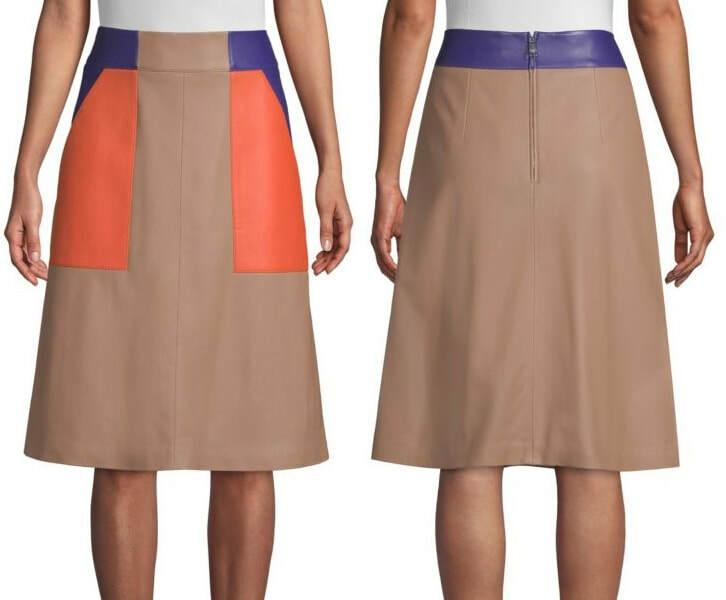 ID Update: The colour-block leather midi skirt is BOSS ‘Seplea’ Colorblock Leather A-Line Skirt. The skirt is currently retailing at Saks Fifth Avenue and Nordstrom for $695. Queen chose the matching coloured accessories. She was wearing Magrit Cognac Leather Laura salons with striped closing that she debuted last week with Carolina Herrera tailored suit. 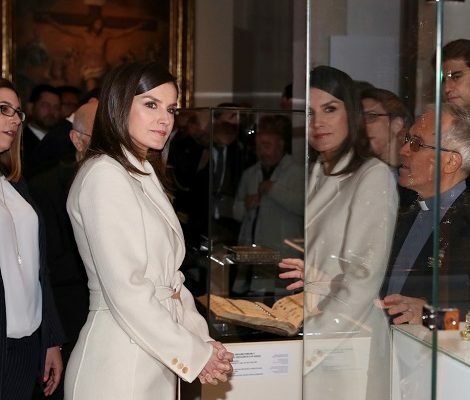 Letizia was seen carrying an orange python clutch and finished her look with Lisi Fracchia sphalerite drop earrings with green garnets and opal. 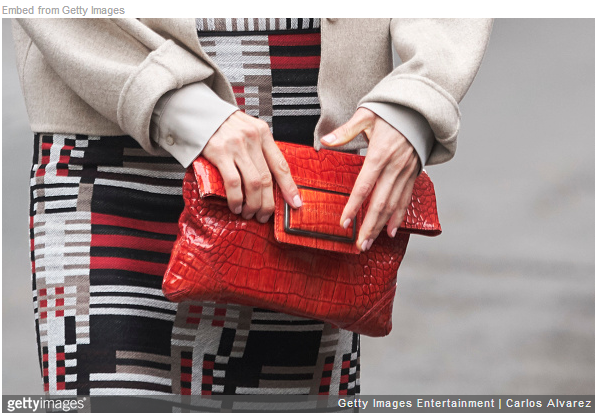 ID Update: Queen Letizia is carrying Angel Schlesser Croc- embossed orange handbag. Huge thanks to elestilodelacasareal on Instagram for Id information. It seems the handbag is part of Queen’s impressive wardrobe since 2011.